In my personal opinion, it’s never too early to start planning your holiday dishes and gifts. Getting a jump start on things helps me stay on budget and stay sane when the holiday chaos sets in. 🙂 This means that I’m constantly on the lookout for easy recipes that’ll feed a crowd, homemade gift ideas (especially easy Mason jar gifts), and dishes that are good to take to holiday parties, like Christmas cookies. 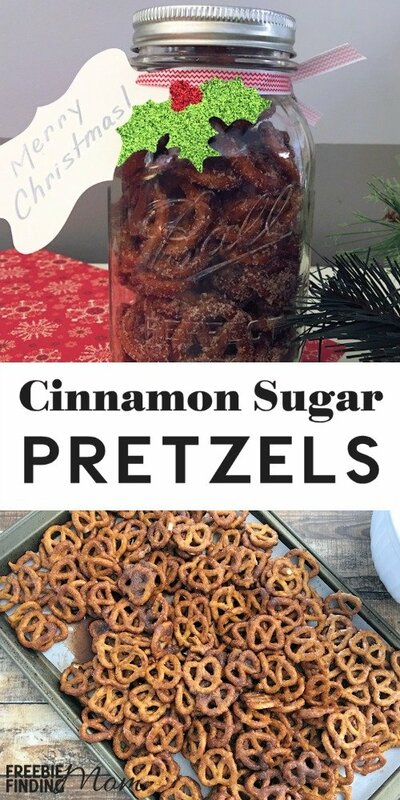 I’m pleased to say that my latest find, this cinnamon sugar pretzel recipe, is both a great DIY gift and perfect to make for a holiday party. I actually encountered this cinnamon sugar pretzel recipe when my aunt made it last year for our family at Christmas time. 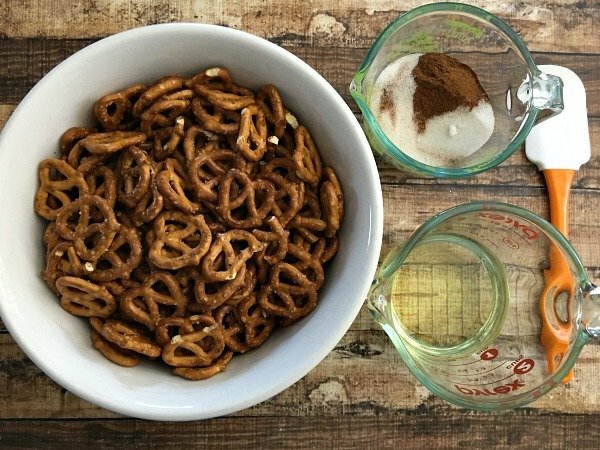 I quickly realized not only would this cinnamon sugar pretzel recipe be great for the holidays, but it would easily qualify as fun snack ideas for my kiddo. 1. 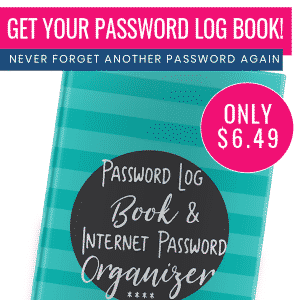 It’s super quick and easy. You only need 4 ingredients for this recipe, and I’d be willing to bet that 2-3 of them are already in your kitchen. Plus, from start to finish, this cinnamon sugar pretzel recipe only takes about 35 minutes, and for 30 of those minutes the pretzels are in the oven. 2. You can easily make this recipe in bulk. 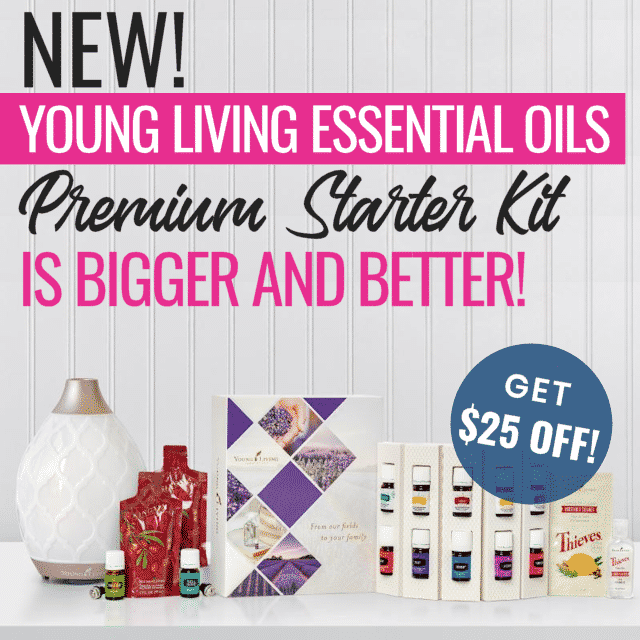 Have a large family or group of friends? If you need food to feed a crowd, this cinnamon sugar pretzel recipe is a must. The recipe below is for an entire bag of pretzels… you can easily double or triple it to make even more tasty pretzels. 3. It’s not too sweet. Around the holidays there are always so many sweets. Cookies, fudge, pies, etc. seem to be everywhere. This cinnamon sugar pretzel recipe provides something that’s a little less sweet than most options which is perfect if you don’t have the biggest sweet tooth. Tip: If you’re looking for a non-dessert option to bring to a party, consider these adorable Christmas tree and snowman cheese balls or this Christmas tree cheese patter. 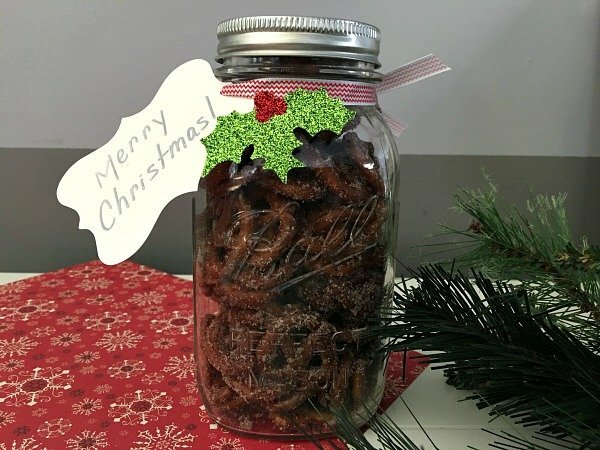 If you want to turn this cinnamon sugar pretzel recipe into a homemade gift, just dump some of the pretzels into a Mason jar, tie some ribbon around it or place a bow on top, and attach a homemade label or card. Sure, it isn’t the most intricate gift but just about anyone will be able to appreciate this yummy cinnamon sugar pretzel recipe. 1. Preheat oven to 300° and line a baking sheet with parchment paper. 2. 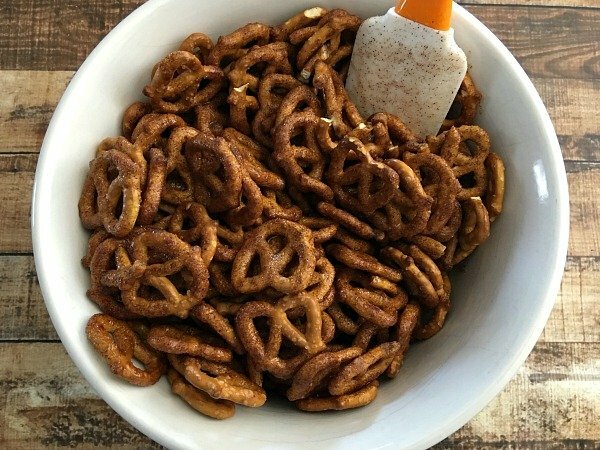 Dump pretzels into a large bowl. 3. 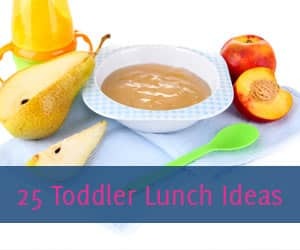 In a small bowl or measuring cup mix together oil, sugar, and cinnamon. 4. Pour sugar mix over pretzels and carefully mix with a spatula. 5. 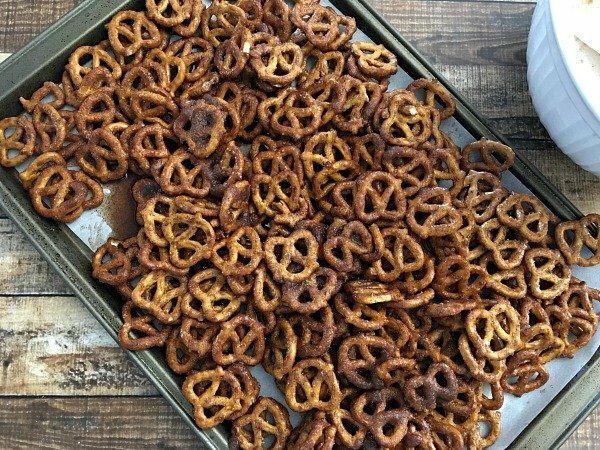 Pour pretzels onto baking sheet, spread pretzels out into a single layer (or as close as possible), and drizzle any remaining sugar from the bowl over pretzels. 6. 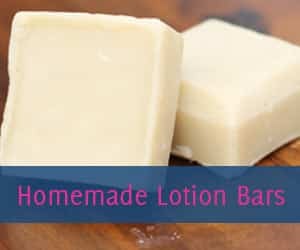 Bake for 30 minutes, mixing every 10 minutes. 7. 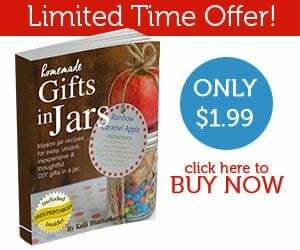 Let cool and enjoy or place in large Mason jars to give as gifts! 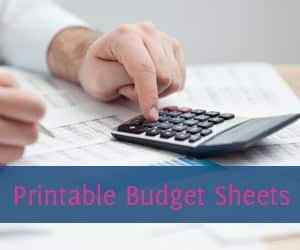 If you’d also like to save money and eliminate some of the stress of the holidays by planning ahead, be sure to follow Freebie Finding Mom’s Christmas Recipes, Mason Jar Crafts, Gifts & Recipes and Homemade Snacks Pinterest boards. Here’s to a fun, frugal, and homemade holiday season! Instead of vegetable oil, can you use canola oil? Can you just use butter? 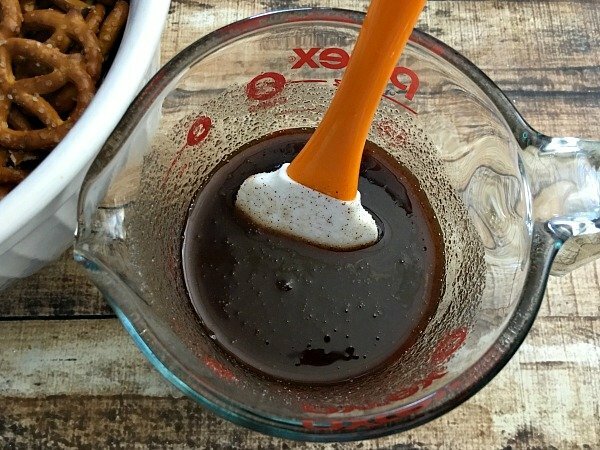 I have a recipe for quick and easy cinnamon pretzels that calls for 3/4 cup coconut oil but doesn’t say if it is the liquid or the one in the jar. Please help I wnt to make them soon.